Well, it?s taken quite a while, but it?s finally here. This is the first British-built Stylophone since original production ceased in the mid-1970s (the highly popular S1 is made in China), and the first-ever Dübreq instrument aimed at serious musicians. There has been a lot of hype surrounding the S2, its specification and its launch at the 2013 Winter NAMM show in California. There has also been a lively dialogue between various parties, the overall gist of which is ?That?s a lot of money for a Stylophone!? vs ?That?s a lot of hand-made British analogue synth for not much money!?. Let?s get two things straight to start with. 1. This is NOT, repeat NOT a souped-up or stage-hardened version of any previous Stylophone. The only thing that this instrument has in common with previous Stylophones is the playing technique. Oh, and if you want you can even play it without a stylus! 2. This is NOT, repeat NOT a Moog-style synth with traditional architecture, ADSR envelopes and performance controls. If that?s what you are looking for, there are various other synths available that will float your boat. But don?t knock the S2 for being different. 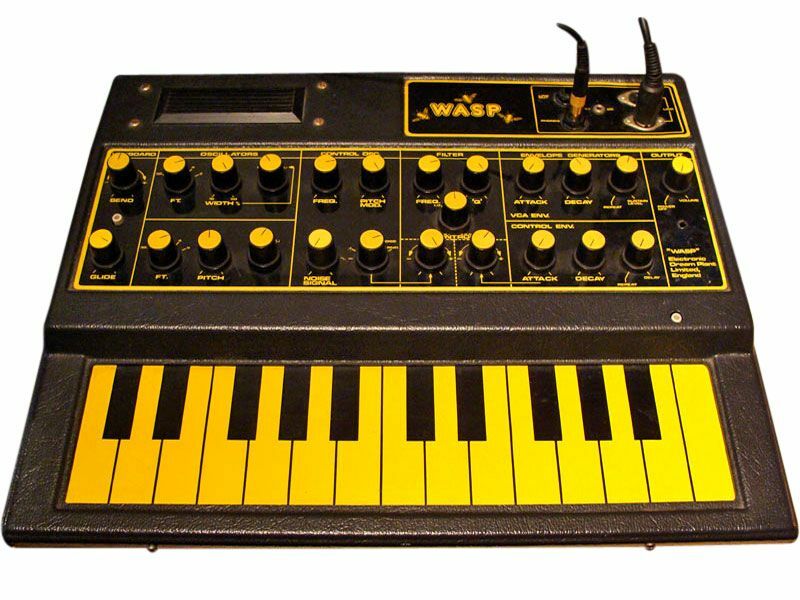 Perhaps the closest thing to the S2?s architecture was a strange late-70s British monosynth called the Wasp, made by a company called Electric Dream Plant or EDP. Like the S2 it had two oscillators, a simple AR (attack/release) envelope, a very flexible filter section and a versatile low frequency oscillator. Like the S2, the Wasp also rejected the conventional piano-style keyboard, in this case largely to make the instrument more affordable. The Wasp had a 2-octave yellow and black membrane keyboard and a flimsy black plastic case. It also had a rich and powerful sound, even if the keyboard was a bit tricky to play. In 1978 when it was launched, it cost £200, equivalent to about £930 today. The EDP Wasp (1978) – the S2’s spiritual ancestor? Now let?s look at the Stylophone S2. It has a three-octave C-C printed-circuit keyboard, with the traditional Stylophone key layout (the sharp keys are grouped together in pairs and threes with no space between them). The keys themselves are considerably larger than those of earlier Stylophones, and this, along with some crafty electronics, means that if you want, you can play the keyboard with your finger rather than the solid-metal cordless stylus. The case is made entirely from metal. To put the price in perspective, the list price of £300 would have been the equivalent of about £65 in 1978, a third the price of a Wasp. The case is unlike anything which has ever borne the name ?Stylophone?. It is a piece of pure hi-tech design. The case itself is made from two matt-black powder-coated aluminium extrusions, fitted together to form a rectangular-section box about 30 cm long, 12 cm wide and 2.5 cm high. Each end is capped with a 5mm thick solid anodised aluminium panel which has had various recesses milled out of it. The case is held together with Allen-headed bolts, giving it a business-like and tough appearance. The top surface of the box has various holes punched in it; the keyboard occupies about a third of the depth of the case and finishes about 1 cm from each end of the case. Above the left of the keyboard is a large circular hole through which protrudes an anodised brushed aluminium disc with a stylised ?S2? logo milled into it. The gap between the disc and the edge of the hole acts as a port for the built-in speaker, but it is also the main display for the synth?s operating system, thanks to a ring of eight blue LEDs concealed under the edge of the hole, which reflect off the disc?s concave sides. To either side of the circular hole is a curved column of six touch-pads, each with an imbedded red LED. The left column has a group of four pads, a gap and then a further pair of pads. The layout on the right is reversed. Intentionally or not, the whole thing is reminiscent of the Ministry of Sound logo? The other controls on the top of the instrument are a horizontal row of rotary knobs. These are quite small, and made from black plastic with a white cap and pointer. Above each knob is printed a curved wedge (two in some cases) of vertical lines to show the direction of the knob?s effect, and below each is a symbol describing the knob?s function. Finally there is a small circular hole near the upper right end of the instrument, marked with a white arc. This is simply a handy holder for the stylus. That?s it, apart from the classic Stylophone logo, screen-printed, along with all the other markings, in white. The left-hand end cap has five sockets; one 6.3mm (¼?) in the middle flanked by two pairs of 3/5mm (??) sockets. From left to right they are headphone, external input, line out, trigger in and control voltage in. Yes ? you can actually control this thing with an external sequencer or keyboard, or process external signals with it! The right-hand end cap has four buttons and a socket for an external power supply (not included). From left to right the buttons are: volume up and volume down (white), self-tune (black) and power (red). The volume buttons only affect the built-in speaker and the headphone output but not the line out. Shame, because when you?re playing through a powerful amp on stage you may want to turn up or down. I recommend the use of an in-line (guitar) volume pedal. The manufacturers call the self-tune feature ?auto-tune?, but it?s not auto-tune as in T-Pain. It?s a clever routine that makes sure that the oscillators are tuned to the correct pitch at each octave, and it?s probably worth running it every half hour or so. These are real transistor oscillators, and their pitch will drift. Press and release the self-tune button and the synth will play a series of eight notes. Twice. That?s 8 octaves of C?s for each oscillator. As it tunes each C, the blue ring of LEDs rotates, clockwise if it?s flat, anti-clockwise if it?s sharp. This is the coarse-tuning routine, and takes a few seconds. Once you have done this, you can fine-tune the oscillators by pressing the black button for about three seconds and then releasing it. This will complete the tuning process. I advise you to run the fine-tune routine once well before you are due to play, once just before you need to use it and then as required. This will allow the oscillators to stabilise (they are sensitive to temperature). It is probably best not to plug into an amp while tuning, although if you ensure that the low pass filter is on and the filter cutoff frequency is set to zero beforehand, it effectively mutes the self-tuning process. The underside of the S2 has two inset sliding panels, or rather, two compartments sharing a panel. The wider one is, as expected, the battery compartment, with space for four AA batteries, held snugly in a pair of plastic holders. Opening the battery compartment (neatly secured with a magnet ? a classy touch) simultaneously opens a narrow compartment alongside, revealing a plastic block with a recess in which lies the stylus. This couldn?t be more different from the Biro-inspired stylus of yore. It?s a beautifully-machined solid aluminium pencil, with a conical brass nib apparently seamlessly attached. And no cable either. The overall impression of the S2 is simultaneously retro, contemporary and futuristic. It has an air of retro stealth to it; of James Bond gadgets, Gerry Anderson props and the dashboards of classic British sports cars, but it also looks like something from TRON Legacy, especially with all the red and blue LEDs flashing and spinning. It looks and feels high-quality. One minor quirk is that you are advised to touch the metal case while playing to ensure reliable triggering. This only applies when the S2 is not plugged into an amp or recording device, so you will probably be holding it anyway in those situations, but it is worth remembering. If you are not familiar with the concepts involved in subtractive synthesis, I suggest you do a bit of reading on the subject and then come back to this review, as I don?t have the time or space to explain what an LFO or a VCF are or do. The touch-pads, their red LEDs and the ring of blue LEDs around the speaker port are the key to using the S2 effectively. Most of the touch-pads offer several options, which are stepped through sequentially on each touch of the pad. For example, the top left-hand pad gives a choice of square or saw-tooth waveform, with or without sub-ocillators one or two octaves below (or both) for Oscillator I, offering a total of eight options. Each option is indicated by a single blue LED, and the first option (square wave with no sub-oscillators) also illuminates a red LED on the pad. This gives you something of a visual reference point, as the blue LED ring reverts to indicating the LFO speed when not displaying parameters. An identical choice of waveforms for Oscillator II is selected from the next touch-pad down. The third left-hand pad offers three flavours of ring modulation or none, and the fourth turns oscillator II hard-sync on or off. This can help ensure that Oscillator II is fixed at a set interval to Oscillator I without causing chorus effects or beating. The final pair of pads on the left are octave shift up or down, covering a total of five octaves, and with a red LED marking the highest and lowest settings. With the sub-oscillators selected, the lowest setting can produce powerful sub-bass frequencies. On the highest setting, the top octave of the keyboard doesn?t play a correctly tuned chromatic scale. The right-hand pads start with a pair that independently turn the two filters on and off. That?s right ? there is a low-pass and a high-pass VCF, sharing the same controls and settings. When both are on they form a powerful band-pass filter, and with both off, you have what the manufacturers call a ?weak notch? filter, which still responds to the filter controls. The next pad down assigns the detune control to one of the two VCOs, allowing them to be offset by as much as several semitones. Pressing it toggles between Oscillator I and Oscillator II, and pressing it twice sets both oscillators to approximately unison, irrespective of the detune control?s position. Below this are three pads which are related to the LFO (confusingly referred to as ?oscillator III?). The first LFO pad assigns the LFO to control both oscillators, Oscillator I only and/or the VCA. The second LFO pad determines whether the LFO is free-running or if it retriggers on each new note, and if so, at what point in its waveform. This is important, as it allows the LFO to be used as an envelope generator, opening the door to filter sweeps, repeat percussion and other effects. That?s it. Everything else is down to the ten rotary knobs and playing technique. 1. Oscillator detune. This works in conjunction with the Oscillator Detune pad, and allows the selected VCO to be detuned by about plus or minus a seventh. 2. Oscillator mix. This determines the volume balance between Oscillators I and II. 3. Square-wave pulse width. If either oscillator is set to square wave, this adjusts the mark-space ratio of the waveform to give a variety of reedy to hollow tones. This control also adjusts the LFO pulse width when waveform 6 is selected. If sub-oscillators are being used, it may be necessary to increase the setting of this control. 4. LFO (Oscillator III) speed. During normal play (when parameters are not being selected), the speed of the LFO is indicated by the rotation of the ring of blue LEDs. 5. LFO depth. This controls the amount of modulation sent to the Oscillators and/or VCA, depending on the setting of the fourth right-hand touch-pad. 6. Attack time. This only affects the VCA, and only applies when the stylus (or a finger) first touches the keyboard ? notes within a slide will not retrigger the envelope, although each note in a slide WILL retrigger the LFO if a retrigger mode has been selected. 7.Release time. This again only affects the VCA, and only applies when the stylus (or finger) has physically left the keyboard. A fast attack and medium to long release time can produce percussive effects by tapping the stylus rather than holding it down. 8. LFO filter modulation. This controls the amount of LFO signal applied to the filter(s). This control interacts with the cutoff frequency control. 9. Filter resonance (Q), This controls the intensity or resonance of the filter(s). The filters of the S2 cannot be made to oscillate. 10. Cutoff frequency. This controls the cutoff or bandpass frequency of the filter(s). So what can it do, what can?t it do, and what does it sound like? Well, there is a British food product called Marmite (a yeast-derived savoury spread), and common wisdom has it that you either love or hate the taste of it. I suspect that the S2 may divide the public in a similar way. The Stylophone S2 is capable of producing deep, earth-shaking bass sounds. With practice and patience, it can do fair imitations of string, woodwind and brass instruments, as well as producing odd bleeps, bloops, dissonant noises and strange sci-fi sound effects. It can even sound ? get this ? like a classic Stylophone, with the added bonus of a filter to take the harsh edge off the sound, and of course a 3-octave keyboard. The S2 has no performance controls. That?s right ? no pitch-bend facility at all, and just the LFO depth control to add modulation. There is no facility for keyboard glide or portamento. The closest you will get is the classic Stylophone slide, although the LFO retrigger function does make it a more expressive playing technique than you might imagine. One other missing facility is a noise generator ? the LFO has a Sample & Hold waveform which can produce noise-like effects at high rates, but it is still a modulation rather than an audio source, So the sounds that are difficult-to-impossible to get from the S2 are swoops, screaming pitch-bent lead lines, unpitched percussion and hissy, swooshy noise effects. Also, bear in mind that if you are using the LFO as a filter envelope, you won?t have a source for vibrato or any other kind of modulation. But as I said, this isn?t intended to be a budget Moog. If that?s what you want, look elsewhere. If you are the sort of musician who embraces the unusual or the eccentric, you are likely to love the Stylophone S2, with all its quirks and limitations, simply because it is a synth that dares to be different. Dubreq was never likely to put a real keyboard on this, and once you have made the fairly radical decision to adopt an unusual playing technique, you might as well see how else a traditional design could be changed. 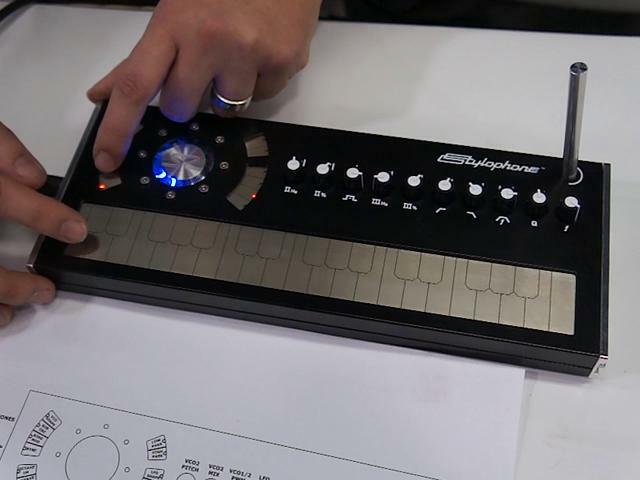 What I would like to see in the Stylophone S3? Using the LFO as a filter envelope is a useful trick, but it puts restrictions on playing technique – hold a note down for too long and the filter sweep will start again. A simple addition to the retrigger modes could allow the LFO to play half a cycle and then stop. One serious issue is visibility. On a darkened stage (or even in some normal lighting conditions) the keyboard can look like a featureless expanse of metal – the dividing lines between the keys are often difficult to see. I have actually made a simple modification to my S2, consisting of adding a strip of white 12v LEDs under the keyboard, connected across the external power socket. The keyboard comes to life in a blaze of glowing green outlines. It does leave an unlit rectangle where the battery holders are located and will of course render the S2?s warranty void, but it is a consideration if you want to play it with any degree of accuracy anywhere other than in a brightly lit studio. It would be nice to see some sort of portamento (even just a selection of preset rates or speeds), an LFO trigger and possibly a pitch-bend device. The volume control does not affect the line output. Dübreq really needs to reconsider this – the last professional instrument I saw with no volume control was a Hohner Pianet T in 1980. The Dübreq Stylophone S2 is definitely a classic (if unconventional) British synth, and for a very reasonable price. Yes, £300 IS a lot of money for a Stylophone. But this isn?t a fun toy to leave around the house and play ?Jingle Bells? on. It?s a real, hand-made analogue synth designed for serious stage and studio use, and for the most part it lives up to its promise. Sonically, it is very capable and powerful, and the initially quirky user interface is really quite easy to learn – this little synth is fun and exciting both to program and to play. I hope that Dübreq address some of the issues mentioned above. This instrument is not a competitor with the likes of the reissued Korg MS-20 or the Arturia MiniBrute – it?s an alternative, and in my opinion a worthy one. Dübreq?s own Stylophone S1 has been in production for six years now and is still selling steadily for about £15 (US$22). It offers a one-and-a-half octave keyboard, three sounds/octave settings and a volume control in a retro-style plastic case, if a Stylophone is all you need. Korg?s Volca Keys is positioned between the same firm?s tiny Monotrons and the reissued MS-20 Mini and would appear to be the S2?s closest competitor, offering three VCOs, portamento, three-voice polyphony, ADSR envelope, MIDI input and a sequencer for a lower price. This might be a good choice if the S2 is just too quirky for you. It lacks the S2?s sonic depth and build quality, and might not be sturdy enough for gigging. The Arturia MiniBrute seems to be a popular choice for those after an affordable analogue synth of conventional design. It only has a single oscillator though. “Steven W. Hayes,59, entered into rest on Thursday morning at York Hospital. He was the husband of Doreen (Mummert) Hayes for 29 years. He was born January 26, 1953 in Shirley, Mass. Graduated from William Penn High School in 1971. Steven was the CEO of Speakeasy Vintage Music. He was also a former member of Devers Lions Club of York and a member of the John Link Jazz Trio and The Andy Angel Band. A viewing will be 2-3 p.m. Sunday at the John W. Keffer Funeral Home and Crematory, Inc. 2114 W. Market St. with a celebration of life service to follow at 3 p.m. with a family friend Mr. Don Mitchell officiating. Burial will be at the conveyance of the family. Including his wife Doreen, he is also survived by a daughter Nicole Hayes of Lancaster a step son Chad Snyder of Dover and 3 nieces : Alexi Hayes, Jackie Donagher and April Murtorff, and many friends. Steve was preceded in death by a brother Daniel P. Hayes. Steve was well known to many vintage keyboard enthusiasts as the creator of accessories that helped keep vintage electric pianos and organs on stage into the new Millennium, including preamps, portable Leslie cabs and dedicated amplification systems. He was also a gifted musician, and a genuine friend to many in the on-line vintage keyboard community. He will be missed. We hope to keep you informed regarding the future of Speakeasy Vintage Music. Ladies and Gents, The Nord Electro 3! Here it is – a (very rough) demo, showing the Wurly sound, grand and upright pianos, and Hammond, Farfisa and Vox organs. Sie sind momentan im Archiv der Kategorie Video.